A velvet soft brush that obscures pores with a light touch, in One brushstroke. The diagonal surface featuring a smooth curve reaches into fine crevices such as around the eyes and the edge of your nostrils, allowing you to apply foundation beautifully to every area of your face. The abundant, soft, full-bodied hairs on the brush capture the foundation without letting go. Makeup routine is also speedier. Hold the brush as if holding a pen, with the longer hairs on top. Slide the brush a few times in the same direction to load the brush with the appropriate amount of foundation. 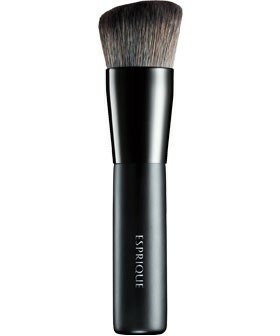 *Do not load too much foundation on the brush as it may cause some of the powder to fly off during application. Spread from the center of the face outwards, in large circular motions. *Use the residual powder to fill in crevices around the eyes and nostrils by lightly moving the brush sideways. Take some of the foundation in the palm of your hand, and load the brush. Go through the same steps as powder foundation to finish.